Iridium satellites were launched by the Motorola Corp in the mid 1990's, but with analog communications going obsolete (according to Motorola anyway) they bankrupted Iridium LLC and it was picked up by a small group and is still now in use for satellite phones and other worldwide communications. 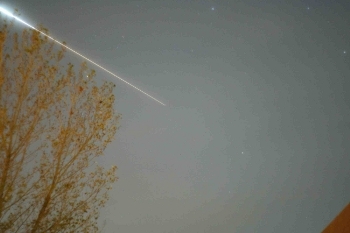 J D Maddy has taken more than 700 photos of Iridium Flares, plus ISS and HST passes. Here are just a few. All pictures taken with a Pentax DSLR IST *D and a 50mm F2 lens at 800 ISO unless otherwise noted. While doing an imaging run of of the Rosette Nebula, this unexpected flare of an unidentified satellite occurred. While doing an imaging run of M31 the Andromeda Galaxy, this unexpected flare of Iridium 50 occurred. A little processing with GIMP photo program after stacking 4 images with Deep Sky Stacker produced some color and detail in the galaxy. 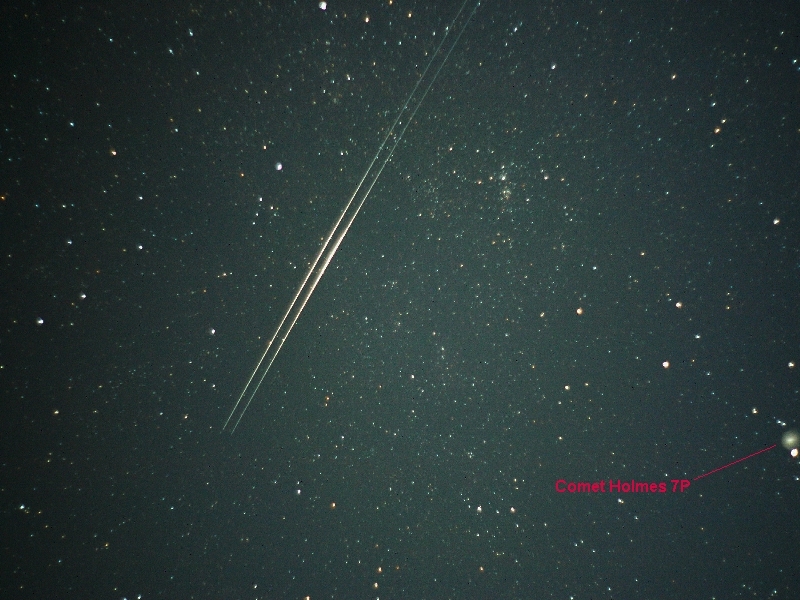 This is a fairly unique double Iridium Flare that also has the Double Cluster and Comet Holmes 7P in it. 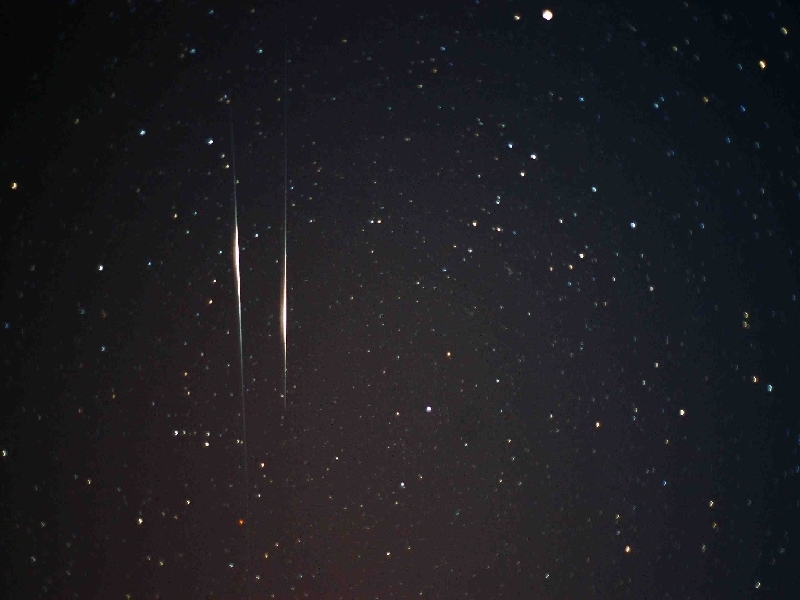 Iridium Flares can happen over most of the sky. 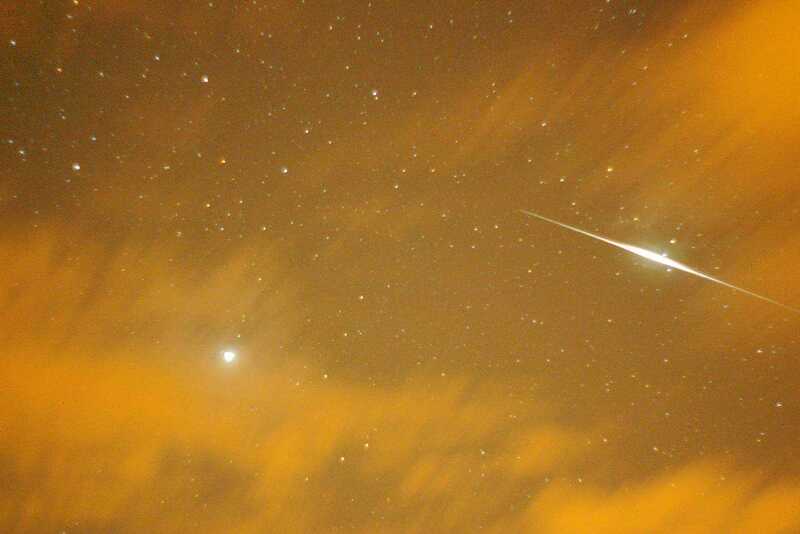 Here, A flare goes through the Hercules constellation just missing M13. Originally, Iridium LLC was to put up 77 satellites. After launching some that were duds, nearly 20 more were put up into orbit. This is one of those duds that is slowly tumbling. Some will tumble faster and flash several times as they pass. 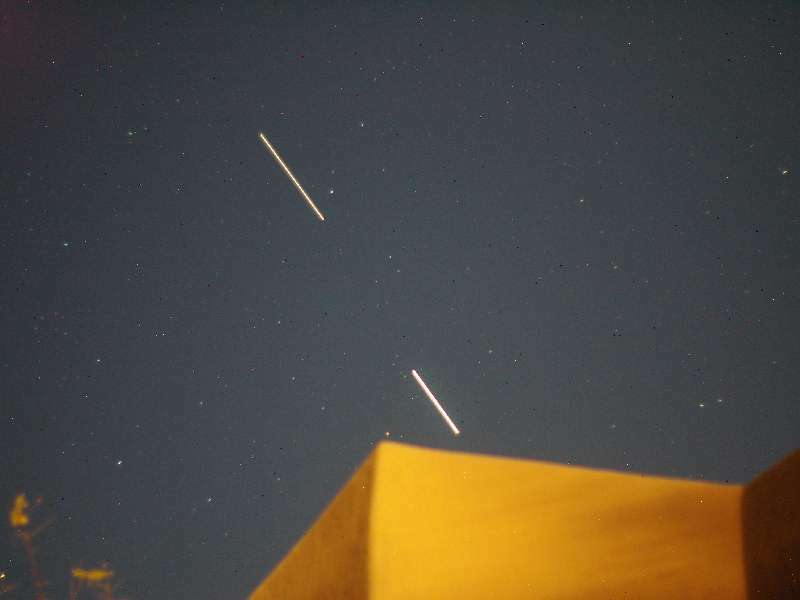 Occasionally, an Iridium will have a spare that is cruising nearby and a double flare will occur. This picture was taken just past sunset. The view is to the north with a thunderstorm on the horizon near Flagstaff. High clouds further enhance the photo. The flare is in the upper right corner of the picture. With over 7000 satellites whizzing about the Earth. It's not too tough to take a picture with satellites crossing paths. 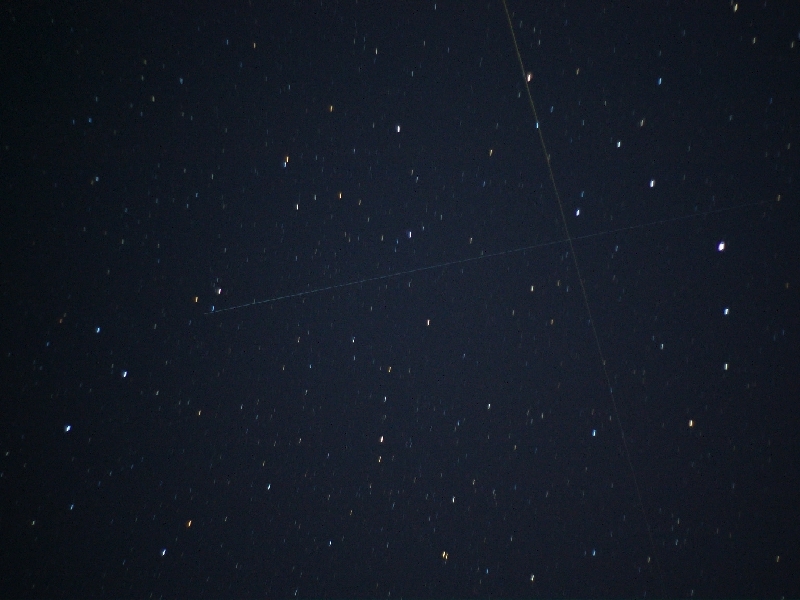 This is an Iridium satellite crossing the path of a Cosmos rocket body. And, even the Hyperstar 3 is not safe from Iridium Flares. This is a picture of M16 with a faint flare going nearby. 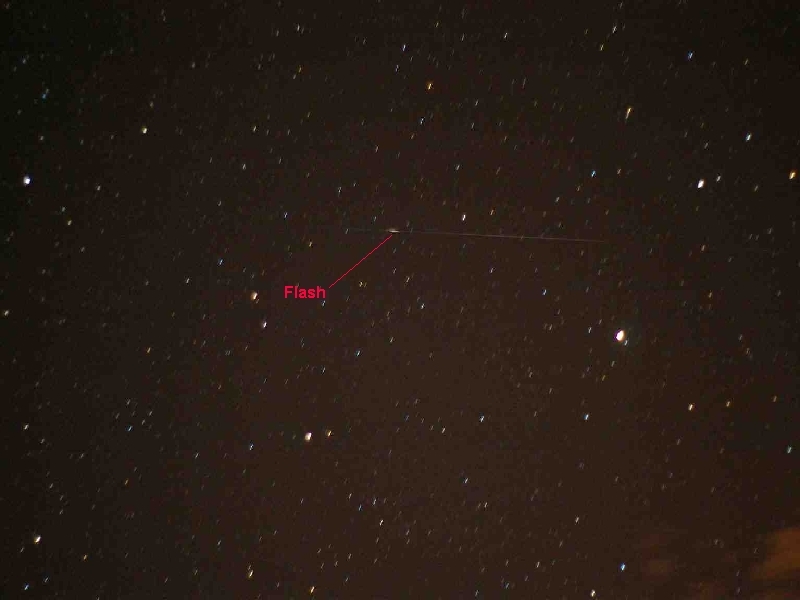 This was taken with a Canon 450D and the Hyperstar 3 on the GPS11. 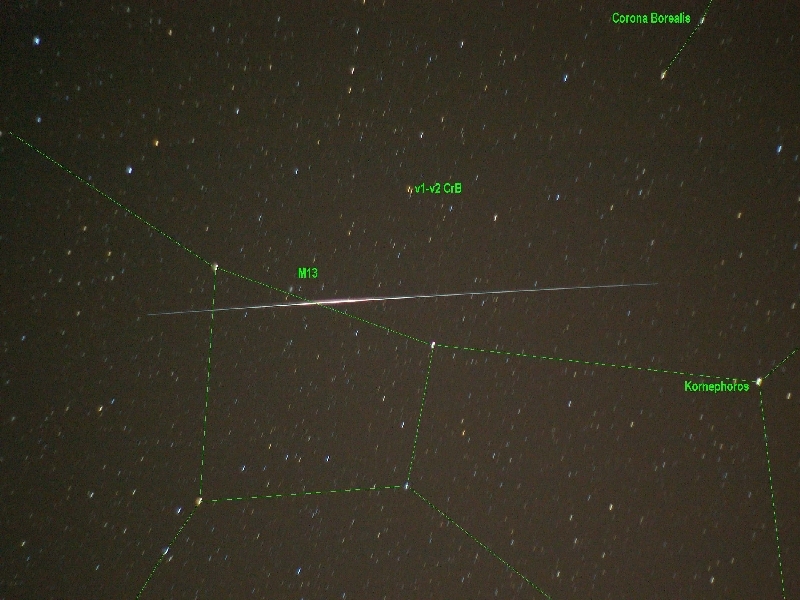 And, again while imaging the Helix Nebula, (NGC 7293) Iridium 28 makes a close call. 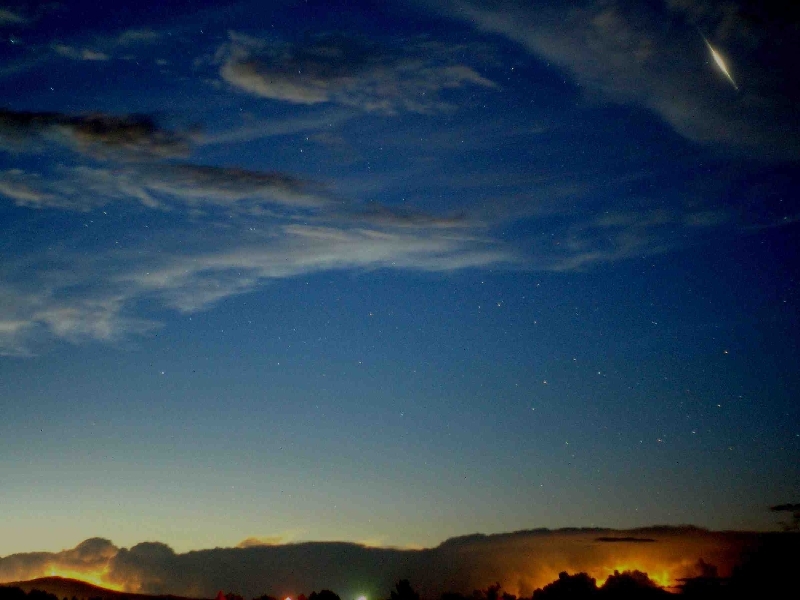 This was taken with a Canon 450D and the Hyperstar 3 on the GPS11. It was too cloudy to photo the comet, so the camera swung over to the Jupiter area to catch an Iridium Flare thru the thin cloud cover. Photo taken at 3:14AM on June 13th, 2010. The International Space Station and Space Shuttle provide unique easily visible satellite passes. Check out http://heavens-above.com for dates and times. 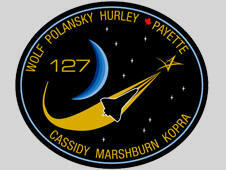 The Shuttle patches courtesy NASA. 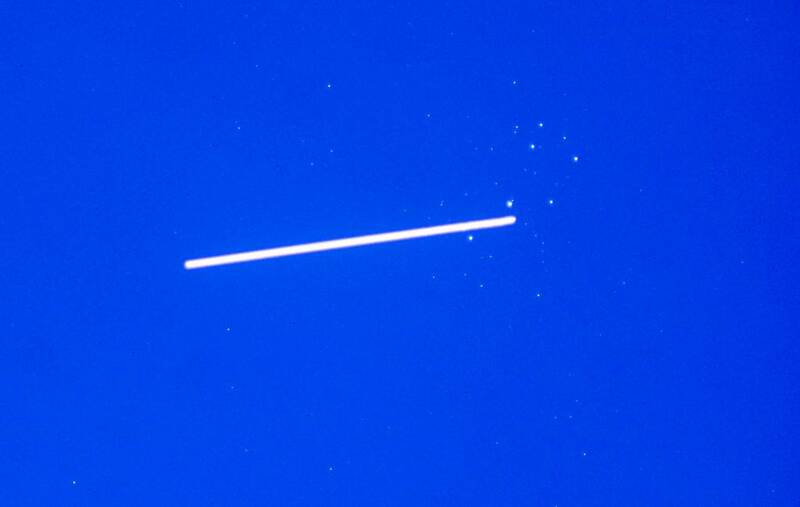 The International Space Station (ISS) passes through the Pleiades on Christmas day, 2010 at 6:14PM. The Atlantis space shuttle follows closely after releasing from the International Space Station (ISS) on November 26, 2009. 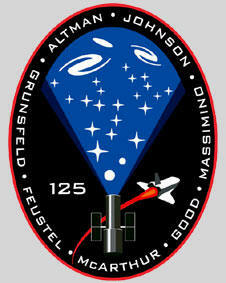 This was Shuttle Mission STS 129. 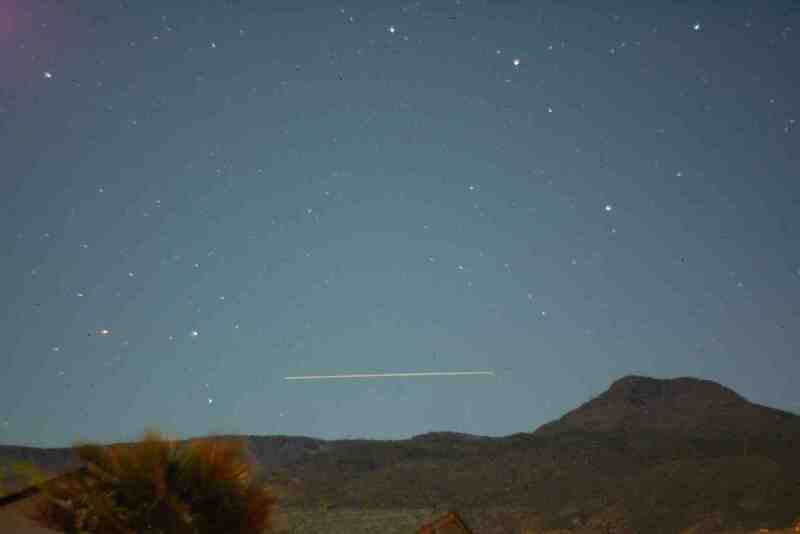 This is a 7.7 second exposure over Casa de Suenos. 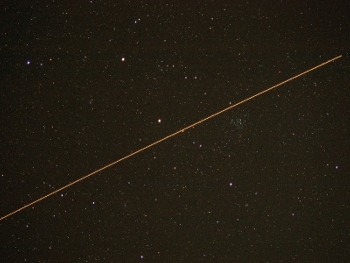 The ISS races along the top of Mingus Mountain on April 4th, 2009. The space shuttle Atlantis has a near miss (not really) with the Christmas Tree Cluster, NGC 2264 while on the way to repairing the Hubble Space Telescope (HST). This was the 5th and probably final Shuttle mission to the HST on May 11th, 2009. The Endeavour space shuttle follows closely after releasing from the International Space Station (ISS) on July 28th, 2009. 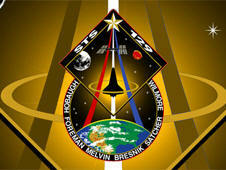 This was Shuttle Mission STS 127. The bright Moon is at the top of the picture. Even the ISS will flare on occasion. This was a brilliant flare from the solar panels on the ISS on November 6th, 2006. 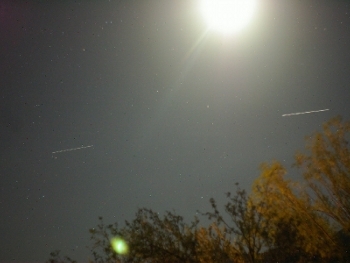 The flare was not expected and the camera was not setup to catch it as it passes thru a neighbors tree. But, at least it shows the beginning of the flare, which was bright enough to cast a shadow.